Take on one of the coldest days in Philly so far for me. It actually snowed this day. It was a light snow, but still . . . SNOW! This is going to be my first real winter. Being from SoCal, this is going to be a big thing for me. I am definitely not prepared at all, and I know that I don't take the cold very well, but I am excited all the same. At least I can keep warm in my new goodies from Nine West. How rad is this coat? A good shape makes a coat, and this one's got it going on. Going to NYC this weekend to celebrate my sister's 21st bday!!! We are also working together on a special creative project that I am very excited about. And it involves me being behind the camera. Perfect timing, too, since I just got my new lens and I am so ready to shooting with it! And check out my new bracelet from 31 Bit. It's made out of rolled, recycled paper by women in Gulu, Uganda. By purchasing jewelry from these women on a monthly basis, 31 Bit provides them with an immediate and consistent income. It's such a great cause. I wear it everyday to show my support. You should, too! I love this outfit!, the coat is really nice! good luck with surviving winter here! i have lived in the northeast all my life...and i still am not used to it. god i hate the cold...blech! Beautiful scarf, looks great on you. I love orange too, have a nice weekend! Yay for snow! Hope your first real winter experience will be wonderful. The orange scarf is a lovely burst of color. Have fun this weekend celebrating Natalie! Orange is my favorite color for the winter months. Cold weather doesn't have to mean a dreary wardrobe. snowwww *. * I wanna seeee it!!! The coat is rad personified, and your style is completely on fire lately, lady. I love the combination with the scarf! fabulous scarf! it really pops against your outfit! I love the shot of colour ! Stunning as always. Love the high-waisted skinnies and scarf! omg thats the cutest and most perfect outfit for winter. I love that look! Really need to get an orange wool scarf myself. You are a winter BEAUTY!! Heheh love the scarf too. he! wonderful coat and scarf colour. I'm the same way, I'm incredibly weak when it comes to cold temperatures, but I love the cold. I love it way more than hot. So lucky to be able to experience an actual winter. I haven't seen snow ever in my life! Amazing coat btw. 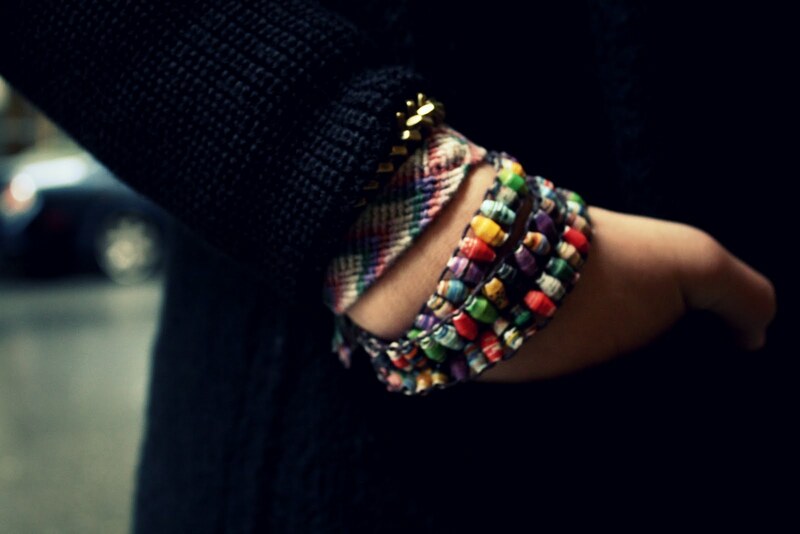 i love your bracelet! it's for a fabulous cause too. so nice and bundled up and warm! It snowed a week a go in NYC, it was amazing. I love these photos and I love it that you are involved with something that helps women in 3rd world countries to help feed their families. I would love it if you checked out my blog, I have interesting fashion posts. Love the bright color detail to your outfit! really great outfit! that orange scarf really pops the outfit! |Like th ered colour in total black look!! 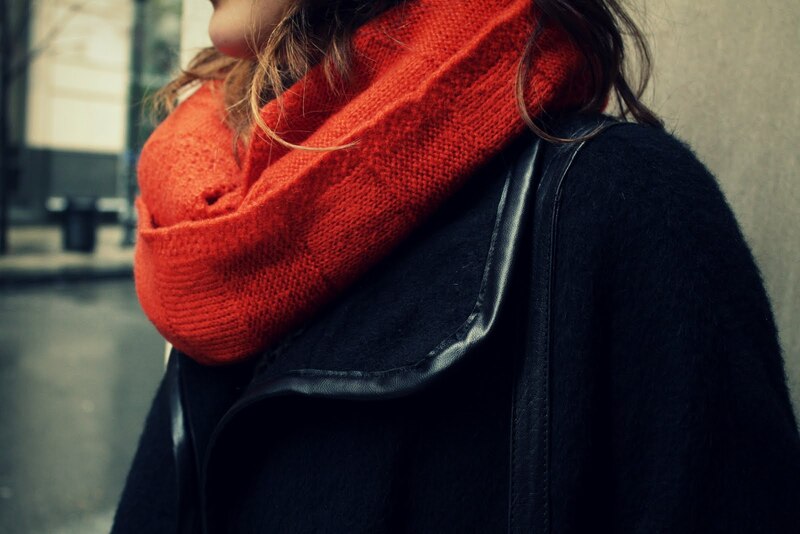 I have an orange scarf and I absolutely love it! wonderful outfit..i love the colours! Love the outfit, & love the new layout of your blog! 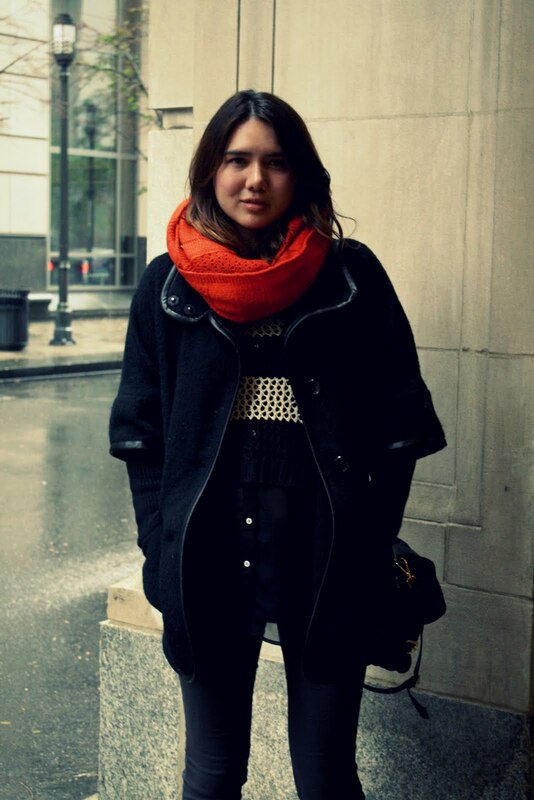 Love how the orange scarf puts a pop of color on a total black outfit. Nice look to stay warm on the snow. Love this pop of color! 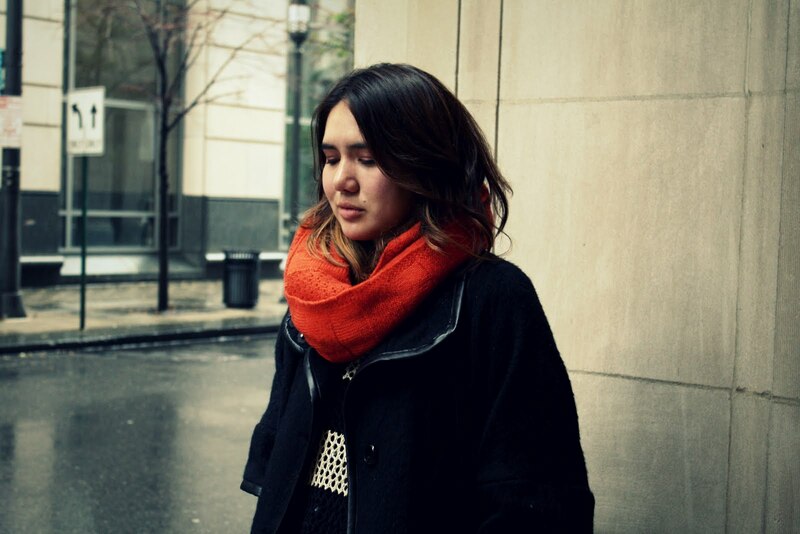 Cant get over how stunning you are and i loveeee your scarf so much !! I love the POP of orange in your outfit, it really incorporates what memories of summer we still have left into a fall outfit. The red snood looks lovely! Would be great if you visit me too..
i only love the sun when i'm at the beach and always prefer to be inside, air conditioned. but having spent a winter in hongkong (just hongkong), i definitely hated being cold! it just froze my face and hands...hahaha. I love the pop of color! Seeing winter outfits make me wish I was on the East Coast. But I'm out in SoCal (UCLA!) right now. We should trade places! 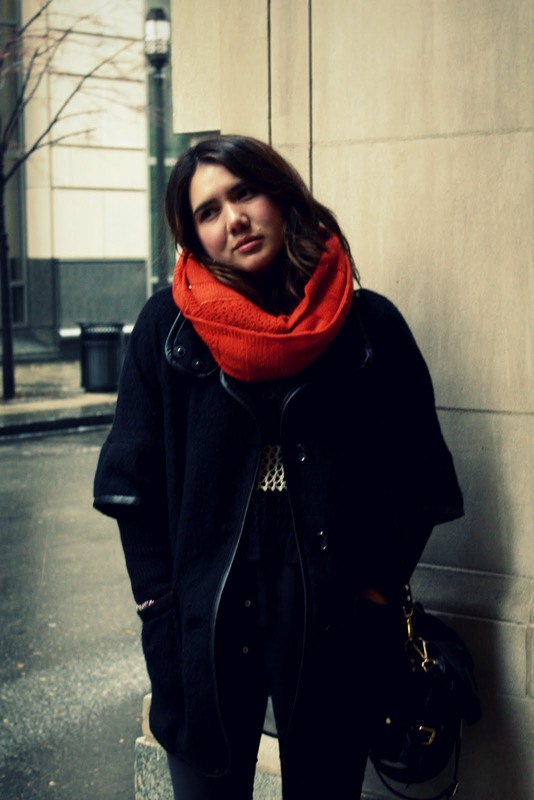 Love the boots and the bright orange scarf is perfect for winter. And don't worry about the cold weather - you'll survive! I am definitely in the market for a bight infinity scarf (thinking mustard) for fall. I tend to wear a lot of black and grey when it's cold so it would add a pop of color like yours does!